A downtick in the U.S. Consumer Confidence survey may fuel the recent weakness in the dollar as it casts doubts for four Fed rate-hikes in 2018. With that said, Chairman Powell & Co. may continue to project a neutral Fed Funds rate of 2.75% to 3.00% at the next interest rate decision on September 26, but another unexpected improvement in household sentiment may spark a bullish reaction in the greenback as it boosts the outlook for growth and inflation. 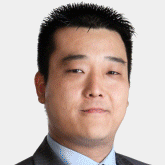 Sign up and joinDailyFX Currency Analyst David Song LIVE to cover the U.S. Consumer Confidence survey. The Conference Board’s U.S. Consumer Confidence survey unexpectedly climbed to 127.4 from a revised 127.1 in June, while the gauge for future expectations narrowed to 101.7 from 104.0 during the same period. Despite the mixed prints, key developments coming out of the economy may keep the Federal Reserve on course to further normalize monetary policy as the central bank largely achieves its dual mandate for full-employment and price stability. 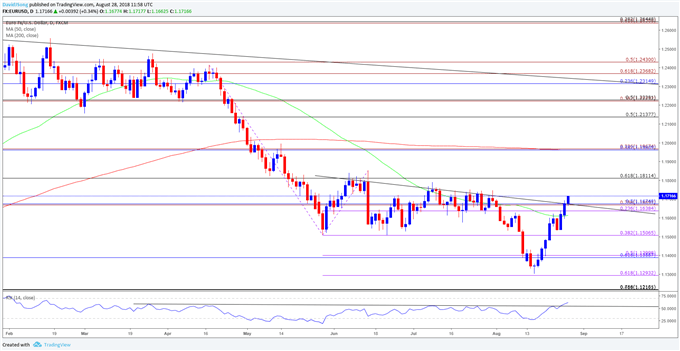 Despite the limited reaction, EUR/USD tracked lower throughout North American trade, with the exchange rate slipping below the 1.1700 handle to end the day at 1.1691. Review the DailyFX Advanced Guide for Trading the News to learn our 8 step strategy. The rebound from the 2018-low (1.1301) continues to gather pace, with the close above the 1.1640 (23.6% expansion) to 1.1680 (50% retracement) region raising the risk for a move back towards 1.1810 (61.8% retracement), which largely lines up with the July-high (1.1791). Keeping a close eye on the RSI as it appears to be leading price, with the oscillator breaking trendline resistance, with the next region of interest comes in around 1.1960 (38.2% retracement) to 1.1970 (23.6% expansion).